Last week was a crazy one in fantasy football circles, with guys like Case Keenum, Jay Ajayi, Kenny Britt, Kendall Wright, and C.J. Fiedorowicz putting up elite numbers at their respective positions. And while you obviously can’t count on huge yardage totals and multiple touchdowns from these types of players on a consistent basis, it highlights that there are almost always lightly-owned options that can slide into your lineup on a week-to-week basis. Which is kind of the point to this whole streaming thing, right? Week 7 is the last of the two-team bye segments, as the schedule makers will sideline at least four teams in each of the next four weeks, including six teams in Weeks 8 and 9. So, while the streamers of the world should have plenty of good options this weekend, things could get a little sticky over the following month. With that in mind, here are some lesser-owned quarterbacks, tight ends, and defenses with fantasy upside in Week 7. As always, ownership percentages noted are representative of ESPN standard leagues. 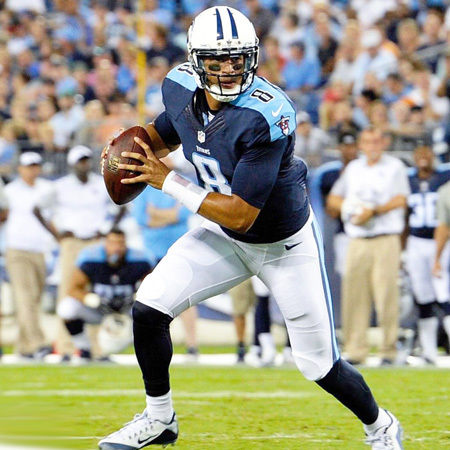 I normally reserve my streaming targets for players owned in less than 50% of leagues, but after three passing touchdowns and 60+ rushing yards in back-to-back games, Mariota is a great Week 7 option that is somehow still available in a lot of leagues. After exploiting Miami and Cleveland over the last two weeks, the Titans continue a great run of favorable fantasy matchups with a home game versus Indianapolis on Sunday. The Colts are a bottom-five team when it comes to defending the pass and have allowed the tenth-most fantasy points to opposing quarterbacks this season, including 269 yards and two touchdowns to Brock Osweiler on Sunday night. Given his recent momentum and a nice matchup, Mariota could easily extend his steak of multiple-touchdown games in Week 7. Am I going to the Alex Smith well again this week? After he disappointed in a favorable matchup with the Raiders in Week 6, throwing for just 224 yards and no touchdowns, Smith gets a home game against a Saints team allowing 301.6 yards passing per game, second-worst in the NFL. Similar to last week, there is a risk that the Chiefs focus on the ground game, especially with New Orleans allowing the most fantasy points to opposing running backs. But the Saints are second in the league in scoring at 31 points per game and this matchup has an over/under of 50.5 points, so I think Kansas City will need to get the most out of all its offensive weapons. Smith has enough upside to warrant streaming consideration. Look, Kaepernick isn’t very good by NFL quarterbacking standards, but he managed 17 fantasy points in standard ESPN leagues on the road in Week 6 against what has been a good Buffalo defense. Having been named the starter again for Week 7, Kaep gets a home game against a Buccaneers defense that has made Case Keenum, Paxton Lynch, and Derek Anderson serviceable in fantasy circles over its last three games. Kaepernick tied Tyrod Taylor for the most rushing attempts by a quarterback last weekend with eight, and the questionable status of Carlos Hyde could lead to additional opportunities on the ground for the San Francisco quarterback, buoying his value for fantasy purposes. With Jordan Reed inactive due to a concussion last week, Davis recaptured a little bit of his old-school form, accumulating 50 receiving yards and a touchdown against the Eagles. Davis only hauled in two catches, but a 37-yard play and a second-quarter score made his final line useful for fantasy purposes. Given an extensive history of concussions, Reed could easily miss a Week 7 clash with the Lions, a team conceding the third-most fantasy points per game to opposing tight ends and the most receiving touchdowns to the position. Assuming Reed is out again, Davis is a nice streaming option in a favorable matchup against Detroit. After a hot start to the season, Doyle had been quiet for a few weeks before taking advantage of a Dwayne Allen injury in Week 6 to gain 53 yards and a touchdown on four catches verses the Texans. With Allen potentially dealing with a high-ankle sprain, Doyle should again be the primary pass-catching tight end for Indianapolis on Sunday. In aggregate, the Colts tight ends have ranked third in the league in fantasy production, accumulating 40 catches for 438 yards and five touchdowns in six games. Tennessee has been fairly successful in defending the position this season, but the Titans are also stout against the run, meaning Andrew Luck’s primary targets will have opportunities in Week 7. With Allen likely sidelined, Doyle has considerable fantasy upside. Fiedorowicz had a big game in front of a primetime audience on Sunday night, catching six passed for 85 yards and a touchdown. However, this was actually his third consecutive game with productive fantasy output, having accumulated eight receptions, 109 yards, and another score over the previous two weeks. The Texans have a tough matchup on Monday night with a Denver defense that is allowing a league-low 182.3 passing yards per game, but opposing tight ends have found better-than-average success against the Broncos, as the team has conceded the 13th-most receptions and 14th-most receiving yards to the position. Fiedorowicz is a sneaky play that could pay off nicely for fantasy owners this week. When you combine a team tied for fifth in takeaways this season with one that is among the more turnover-prone groups in the NFL, fantasy streaming goodness usually ensues. In this case, the Ravens have forced 11 turnovers in six games, including eight interceptions, which is just one off the league lead. Meanwhile, the Jets trail only Carolina in total turnovers with 15 on the year, while leading the league in interceptions thrown. The Ravens may prefer to face Ryan Fitzpatrick and his careless ways with the football on Sunday, but Geno Smith would also present a favorable matchup. Let’s play the opportunity matching game again! When one team has allowed the most sacks this season and the other has been among the best at getting to the quarterback, it’s another case of fantasy streaming goodness. Indianapolis has been terrible at protecting Andrew Luck, allowing 23 sacks on the year, a full four sacks ahead of the next team on the list. Tennessee’s defense ranks fifth in sacks in 2016, having registered 18 over the first six weeks of the season. There is a risk that the Titans give up a decent point total in this game, but between sacks and the inherent pressure on Luck potentially leading to turnovers, this defensive unit makes for a nice streaming option. The Falcons might not jump to mind as a great NFL defense or even a good fantasy option in most weeks, but after performing fairly well in hostile road environments at Denver and Seattle over the last two weeks, Atlanta returns home for a matchup with the Chargers. Coming off an emotional victory last Thursday over the Broncos, San Diego takes their league-leading 10 fumbles lost across the country to the Georgia Dome this weekend. The Chargers have found a number of different ways to lose games this season and potentially playing from behind against Atlanta’s high-powered offense doesn’t bode well for improved ball security in Week 7. Feel free to drop me a question in the comment section below!